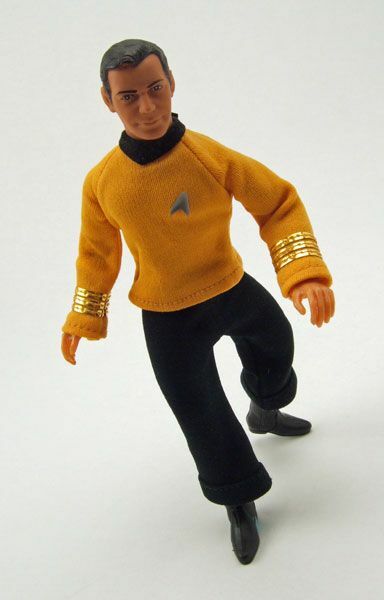 Kirk was released as part of Mego's initial wave of Star Trek 8" figures. The Rundown: I've covered a lot of Kirk figures here in the past 2 years. 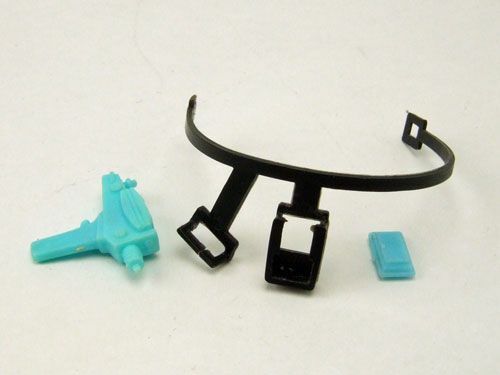 Playmates, Art Asylum, Diamond Select, Ertl, Palisades, and even Galoob (yuck)... If you're doing a line based on Classic Star Trek, the one character that absolutely MUST be made is Kirk. He is the mainstay essential to a complete collection (although I personally believe Spock and McCoy are just as necessary). 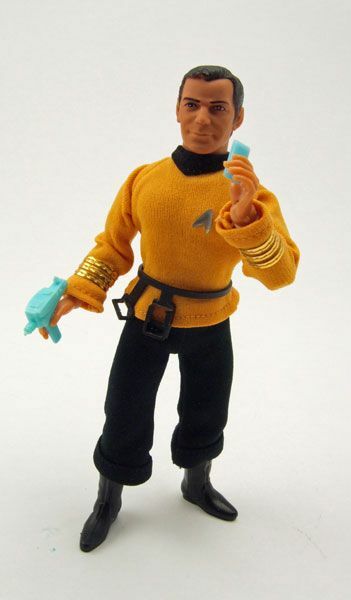 Well, today we take a look at the grand-daddy of Kirk figures: The Mego 8" Captain Kirk figure! Unless you're a Morg living on the surface of Sigma Draconis VI for the past 35 years, you are probably familiar with the style of Mego figures. 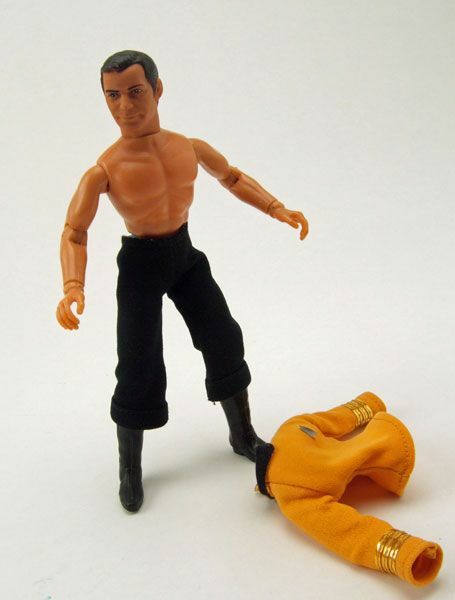 Mego used the buck system before there was such a thing as the buck system- Essentially using a standard body type and outfitting it in different ways for different characters. The body is held together with rubber bands, allowing for a large range of movement. For the time and the price point, the outfit is very nicely handled. 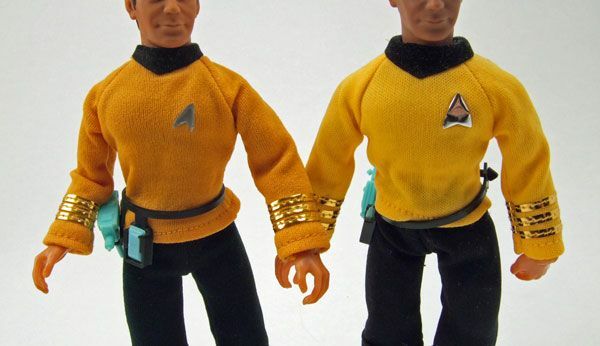 Kirk has the correct number of rank braids on his sleeves, and the black collar is actually a separate section of cloth instead of being just colored that way. The only real issue I have is with the delta shield. Much like the Mego superheroes, the symbol is just a small sticker stuck to the chest. I understand that there were certain limitations back then though, so this can be chalked up to a product showing its age. That's right baby. This Kirk can go shirtless. Bask in the manliness. 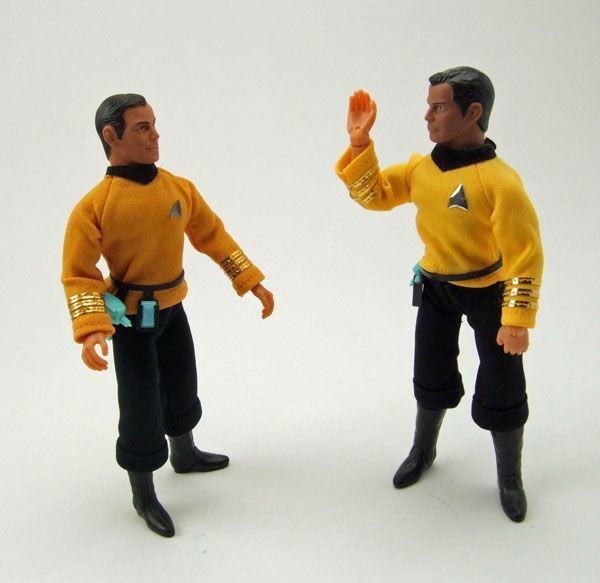 Most notably, the shirt on the reissue version of Kirk is much brighter than his original. The delta shield is the same separate sticker style as the original (mine has apparently just lost its luster over time...). 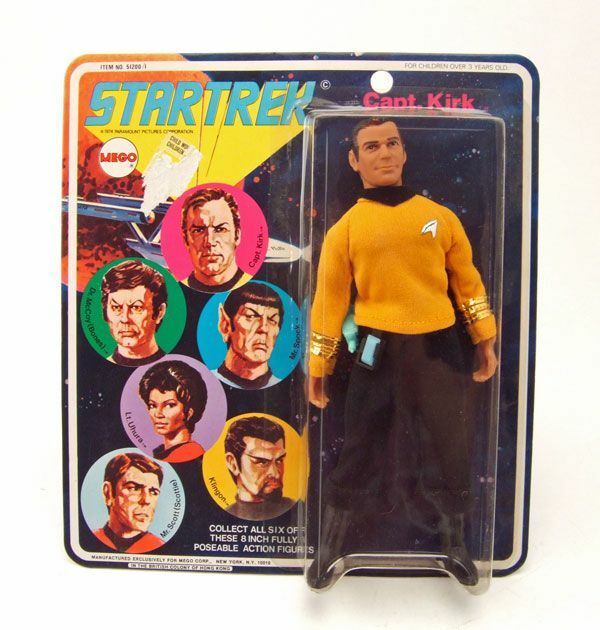 While a loose original Mego Kirk will run you about the same price as the reissue, you may want to snag one of these as well. 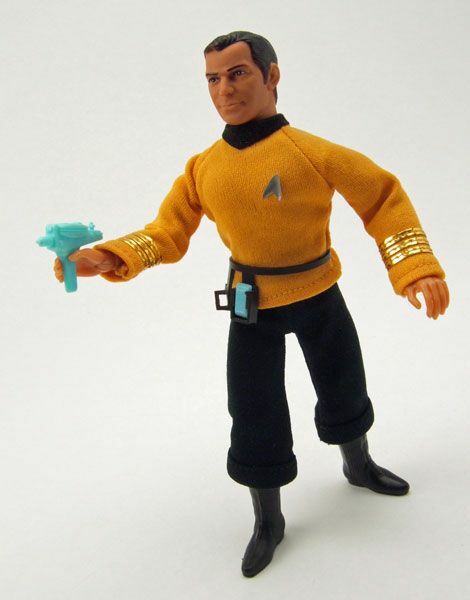 With both Mego-style Sulu and Chekov only being available as reissues, you'll need this Kirk to have all the uniforms in the same matching shade of yellow. 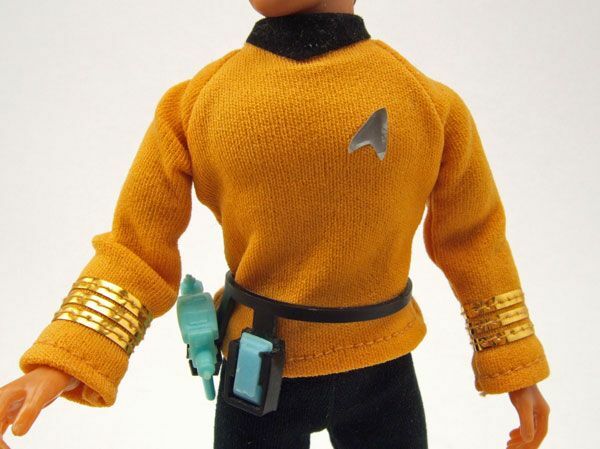 Accessories: Both the original version and the reissue include a phaser and communicator, plus a belt to holster them on. I'm a sucker for weapons' holsters on figures, so I've always been a fan of the Mego "landing party" belt. 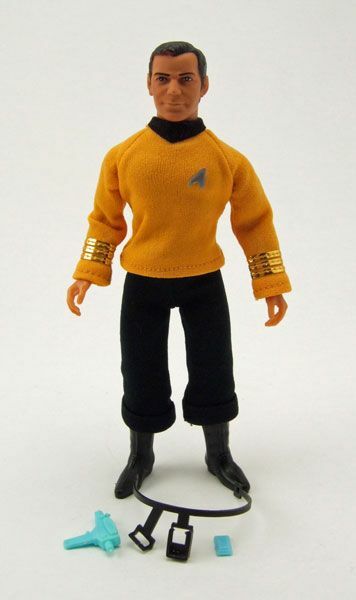 If you don't own a Captain Kirk Mego, shame on you. 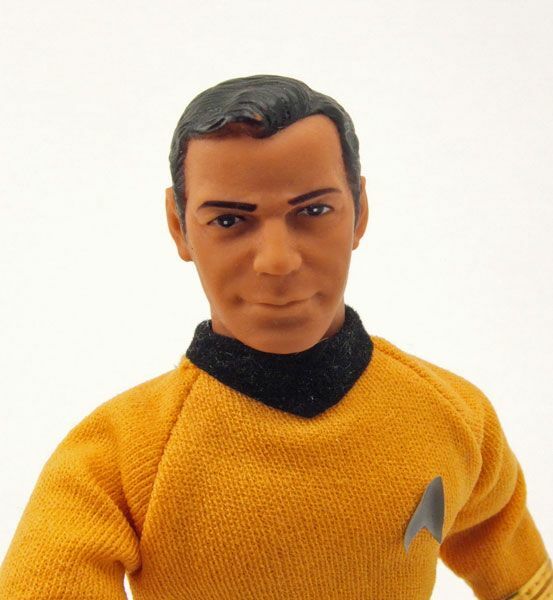 Even if you aren't a fan of the Mego style, every Trek toy fan should have one of these in their collection for sheer historical significance alone. Well, that and he is just plain awesome. You can find nice loose examples fairly cheap (owing to the fact that the figure was produced in pretty large numbers back then). Watch out for that symbol though! Or if the shirt is missing the delta, just chuck it and let Kirk's pecs out to play. You won't regret it... and neither will your female figure collection. Labels: AA/ DST, DST/ EMCE (Mego Style), Kirk, Mego, Mego 8"
In photo #2 (still in the package), with regard to Kirk's stance, it looks like he's channeling Redd Foxx's Fred Sanford! 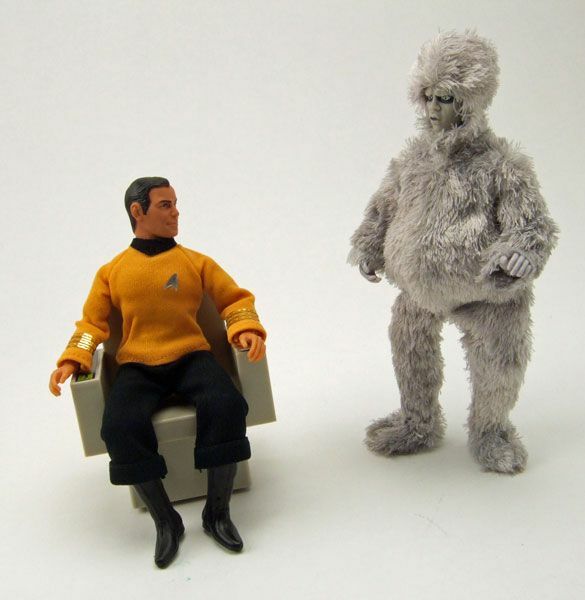 I just hope he doesn't call Mego Spock, "Dummy!" The insignia on the Mego originals was two layers, a fragile silvery foil over gray. The foil flaked away way too easily as I discovered back in the day. When this would happen I would make a new, more "screen accurate" insignia cut from aluminum foil with the proper command/sciences/engineering division drawn on. Hey.... I'm 2 Years Old! Apieceoftheaction.net Beams Up To StarTrek.com!